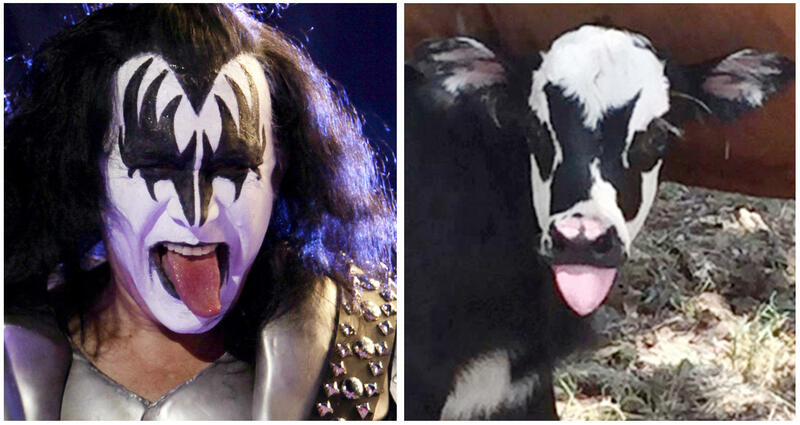 KERRVILLE, Texas -- KISS frontman Gene Simmons is udderly thrilled by a newborn calf born with strikingly similar black-and-white markings to the face paint he wears on stage. The calf was born Friday at a ranch near Kerrville, Texas, which is about 60 miles northwest of San Antonio. Heather Taccetta, who lives at the ranch with her family, said Tuesday that the calf belongs to her grandmother. It is named Genie, in honor of Simmons. Taccetta says the calf and its mother are doing fine and that Genie is a family favorite and won't be sold for slaughter.